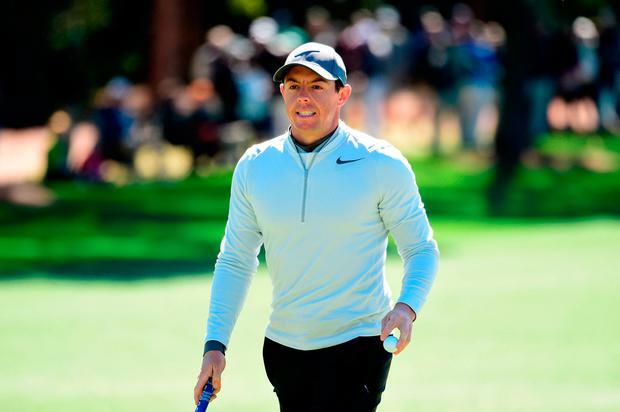 The dream lives on for Rory McIlroy after another battling performance kept him on track for a run at the Masters Green Jacket over the weekend, despite a bad break on the 18th hole of his second round. On a day when wintry playing conditions and a swirling, testing wind made Augusta National an even tougher test than usual, McIlroy set himself up for the big test to come today with a 73 for one-over-par 145. "The weather's going to be better, the wind's not going to be as strong. I'm five behind at the minute and there's probably going to be a good few guys that finish ahead of me going into the weekend. "If I can put together a 67 or a 66 tomorrow, I feel like I'll be right in there for Sunday," he said. Americans Charley Hoffman, Rickie Fowler, Spain's Sergio Garcia and Belgium's Thomas Pieters lead the field into the weekend on four-under par. Fowler took advantage of the easier evening conditions to shoot 67, the low round of the day. McIlroy was entitled to feel disappointed with the finish on 18 where he arrowed a shot right on target, only to see it cannon off the flagstick. He pitched superbly back onto the green but two-putted from five feet. "It was another day when you just had to battle and make a lot of pars and try and pick up the odd birdie," he said. "The wind got me with my putt, sort of the ball went up the green instead of coming back down. "So, yeah, disappointed to finish like that, but I'm still within five of the lead going into the weekend with better conditions on the way. I still feel like I'm right in this tournament." Shane Lowry, however, has a free weekend after his second round was marred by a disastrous six-over front nine. His second-round 79 left him one shot outside the cut mark on seven-over.